President Trump and Swedish Prime Minister Stefan Lofven hold a joint news conference at the White House on Tuesday. President Trump, in a joint news conference with the Swedish prime minister, acknowledged Russian "meddling" in the 2016 presidential election and said his administration is working to counteract any interference in elections in 2018 — even as he downplayed the effect of Russia's 2016 influence campaign. "The Russians had no impact on our votes whatsoever," Trump said. "But certainly there was meddling and probably there was meddling from other countries and maybe other individuals." The president's remarks came the same day as the first primaries of 2018 occur in Texas. Trump was responding to a question from a Swedish journalist about what her country could learn from the American experience in 2016. "You don't want your system of votes to be compromised in any way and we won't allow that to happen," Trump said. "We're doing a very very deep study and we're coming out with I think some very strong suggestions on the '18 election." The president then took a near-minute-long detour to offer some election analysis, saying he expected Republicans would do quite well in 2018 despite the historical precedent of a president's party losing congressional seats in its first midterm election. Returning to election security, Trump endorsed the idea of paper backups for electronic balloting. "It's called paper. Not highly complex computers. Paper," he said. As to whether he is worried about Russian interference in the 2018 elections, "No," said Trump. "Because we'll counteract whatever they do. We'll counteract it very strongly. And we are having strong backup systems," he said. "We haven't been given credit for this but we've actually been working very hard on the '18 election and the '20 election coming up." Trump also expressed optimism about resolving tensions with North Korea, saying he believes the country is "sincere." He defended his recent call for tariffs on steel and aluminum imports, and when talking about White House staffing, said he fosters disagreement among his top aides. "I like conflict. I like having two people with different points of view and I certainly have that and then I make a decision," Trump said. "I like watching it. I like seeing it. And I think it's the best way to go. I like different points of view." But he insisted, contrary to media reports (and a large number of vacancies in key positions), he has no trouble finding people to work in his administration. "Believe me, everybody wants to work in the White House. They all want a piece of that Oval Office. They want a piece of the West Wing," Trump said. The question had been about President Trump's tweet earlier in the day, confirming that he did want to see some change in his administration, and whether that might include Attorney General Jeff Sessions or others in the Cabinet. But he didn't engage regarding whom he wants to see go. Just a couple of hours later, news broke that Gary Cohn, one of Trump's top economic advisers, is leaving the administration, after apparently losing an internal struggle over steel and aluminum tariffs. 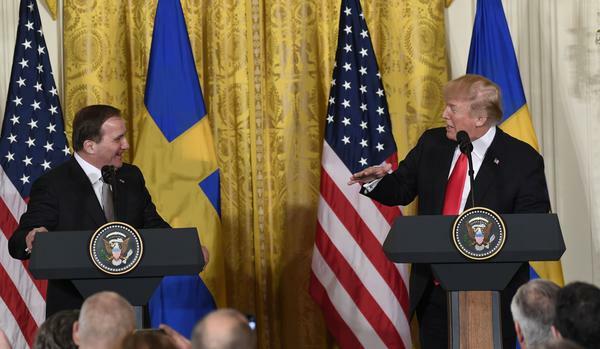 Trump shared the stage Tuesday with Swedish Prime Minister Stefan Lofven and, as is traditional, each leader called on two journalists. In opening remarks, Lofven hinted at a point of conflict between the two friendly nations. "I am convinced that increased tariffs will hurt us all in the long run," Lofven said. Trump clearly does not agree. When asked about urging from Republican leaders including House Speaker Paul Ryan, R-Wis., that he back away from his pledge to impose a 25 percent tariff on steel and a 10 percent tariff on aluminum, Trump was defiant, repeating a frequent claim from the campaign trail and even earlier that the U.S. has been taken advantage of by other countries. "One of the reasons I was elected is I am protecting our workers. I'm protecting our companies and I'm not going to let that happen," Trump said. "So we are doing tariffs on steel. We cannot lose our steel industry. It's a fraction of what it once was. And we can't lose our aluminum industry, also a fraction of what it once was." Although employment in these industries is down significantly, steel and aluminum production has remained stable as a result of increased production efficiency. Earlier in the day, North Korea and South Korea announced an apparent breakthrough in talks. North Korea expressed willingness to denuclearize the Korean Peninsula if military threats against it are relieved and the security of its regime is guaranteed. And North Korean leadership even expressed a willingness to have talks with the United States in hopes of normalizing the relationship. Asked "to what do you owe this recent openness to talk," Trump replied dryly "me." Only a few people in the room chuckled quietly, prompting the president to add "nobody got that." But, he added, "I think they are sincere also because [of] the sanctions." Though he added the world will soon find out whether the North Koreans are, in fact, sincere.